Finally it’s warm enough for basil seeds to germinate outside. With the first glimpse of their little green heads, every spare pot in the house has been filled with compost and pressed into action – to say we love pesto could be an understatement. 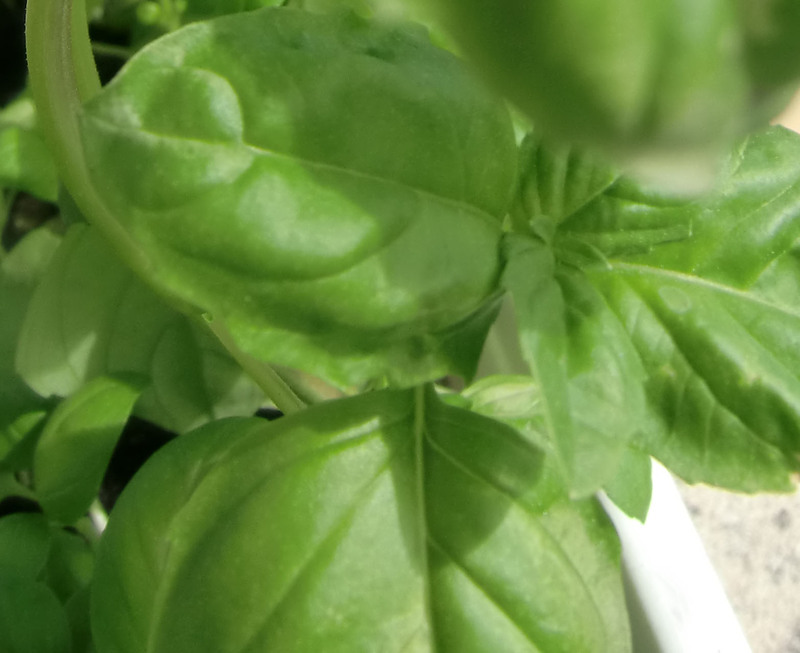 For me, the smell of basil brings a smile, it’s an aroma that conjures up everything that’s relaxed about summer. Anyway, to get down to the business of growing it: in my book, the classic large-leafed basil is the only way to go, however, if you have a passion for a more aniseed flavour buy the slightly crinkly-leaved variety. One seed packet can easily provide sufficient for pesto and salad usage throughout the summer, plus 20-30 packets of frozen pesto stacked in the freezer so that pesto-addicts need never go without. Fill your pots with compost and sprinkle the seeds over the surface before covering with a thin layer of compost and gently firming down. Keep the compost moist, but not drenched, until you see a haze of green shoots. When the plants have produced their first crop of large leaves, pinch out the top shoot to encourage them to expand sideways and stop them from going into their seed-producing stage too quickly. As with lettuce, the trick is to keep harvesting the leaves as you need them, letting the plant rest and produce some more while you harvest off other pots. I thought this was what everybody did until a friend of mine asked to take some basil home with him at the end of a barbecue. “Sure,” I said, beginning to turn to go into the house for a bowl. Before my jaw even had time to hit the floor, he had snapped off four or five plants – he was a chef, not a gardener! Guillotined basil doesn’t live, but had the plants just had their leaves removed they would have continued to produce for one or two months more. While I may not talk to my plants – at least not when anyone’s within earshot – I do advocate being kind to them, it keeps them alive! Try to remember to water your plants a couple of hours before you intend to pick leaves, then they are nice and plump, bursting with flavour and at their best for eating. Personally I don’t like too much oil in my food which is why I always freeze pesto rather than keep it in oil in jars. Small bags take up very little space and make an easy instant meal with a bit of pasta and salad. If you are unfreezing your home-produced pesto in the microwave, do watch it carefully as it unfreezes very quickly and isn’t nearly as good if it’s “cooked”. To make one bag (enough for about 400g of pasta) I put a clove of garlic, small handful of pine nuts (or since they’ve become so expensive, almonds), and some ground black pepper in a small food processor. Top this with basil leaves until they’re at the top of the container without being pressed down. Place 3 or 4 chunky slices of parmesan on top of the leaves and drizzle with a little olive oil. If the mixture is too rough add some more olive oil until it is the consistency you like. Either use it immediately, or scoop it into a small freezing bag and keep for later. For variation, pop in a few dried tomatoes to the mix, it makes the flavour even “warmer”. It’s still a little too early for mounds of lush green basil and my store of frozen bags of last year’s pesto is now very thin. However, mint is in abundance and can make a wonderfully refreshing pasta sauce in the interim. Boil about 350g of pasta according to packet instructions. Take a large handful of fresh mint sprigs, strip the leaves into a food processor, add 3 or 4 good lumps of parmesan, a tub of creme fraiche and a good grind of black pepper. Wizz it all together and then add a couple of tablespoons of the pasta water to loosen the mix. Add either a couple of handfuls of peas, or some asparagus to the pasta a couple of minutes before the end of cooking time, or add some cherry tomatoes directly to the sauce. When the pasta and veg are cooked, stir in the mint sauce and eat! All herbs are perfect for the mini-gardener who only has space for a few pots on a terrace, and good herb pots make a greater impact on your cooking than anything else. Try to keep herbs together that like the same conditions, for example put mint, parsley and chives in one pot and keep it in an area of partial shade, while putting oregano, thyme, marjoram and basil in areas with plenty of sunshine. Most of the Mediterranean is graced with two planting seasons due to the temperate winter climate. By now we’re well into the first one with many gardeners already having their second batch of seedlings coming up in greenhouses or various lesser-used corners of the house. I hesitated before writing the word “greenhouse” because it turns the idea of growing-your-own into something that appears costly and requiring sizeable outlays of space, time and money. This is quite wrong. Growing at least some of your own fruit and veg can be done anywhere. Even when I lived on a boat I would sprout mung beans for use in salads and stir-fries (put some holes in the plastic top of an empty jar, place a thin layer of beans in the bottom, cover with water for 12 hours then shake out. Moisten and drain daily until ready to use) I also used to grow a selection of herbs by placing flowerpots inside 5 litre water containers which had their tops removed. I then threaded a string through the sides to make a swinging handle when we were sailing. These adapted water containers not only ensured the plants never tipped over in a high sea but also acted as mini greenhouses when the pots were on deck. 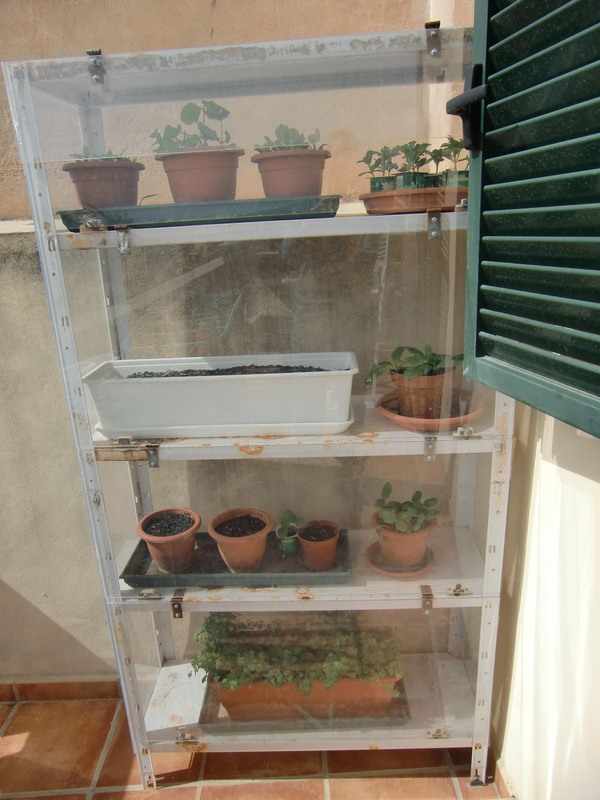 My current “greenhouse” is an old shelving unit with bits of perspex hinged on and sealed with magnets (see photo). Clear plastic sheeting would also work or just transporting your pots inside at night and keeping them in sheltered sun patches during the day will be fine. A friend of mine who lives in an apartment with no terrace still grows rocket and herbs in window boxes. The possibilities are endless and every little helps to make your family’s diet more natural and full of flavour. A packet of seeds will cost you roughly 1.50€ and will contain more seeds than you need for the coming season however many are in your family. 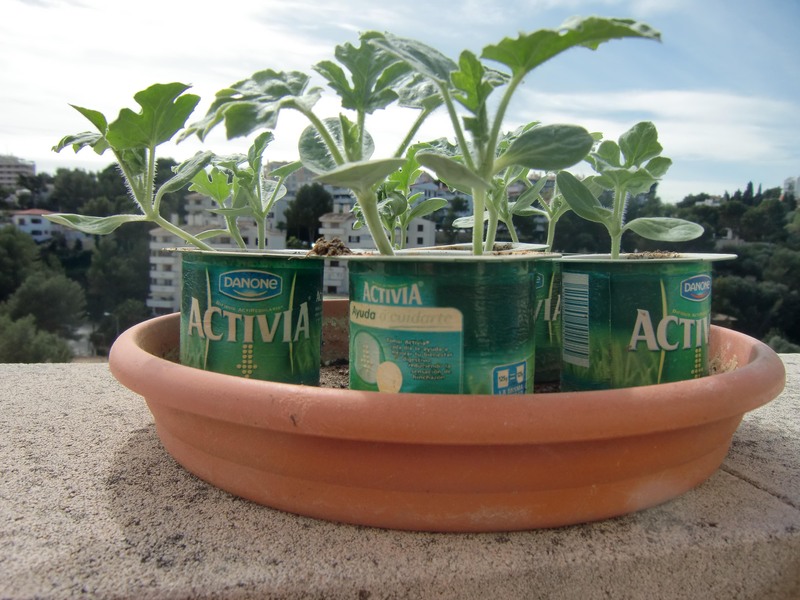 Easily handleable seeds like melons, courgettes and cucumbers do well being sown in individual yoghurt pots with a hole in the bottom (the photo shows this year’s yoghurt-pot watermelon seedlings almost ready for planting out). Smaller seeds like tomatoes, aubergines and peppers are simpler to sow in bigger pots and then thin out to allow the sturdiest plants to grow well before planting. Never skimp on seeds, it’s a false economy. Buy from an outlet that sells in large volume to ensure you’re getting the freshest seed possible as it’s irritating to go to all the trouble of planting only for no shoots to appear. Of the above mentioned list, aubergines and peppers are far slower-growing than the others so you need to begin early if you want to ensure the longest fruiting period. The number of batches you grow will depend on what you most enjoy eating and the space you have available. With cherry tomatoes, pear tomatoes and salad tomatoes I try to stagger 2 or 3 batches so they produce for as long as possible. Although cherry tomatoes can be fiddly to pick they’re great in salads and when there’s a glut they make superb chutneys and jams. Pear tomatoes are best for cooking and many varieties are very heavy croppers so I can usually grow sufficient in a couple of batches to make enough Neapolitan sauce for the year’s pasta dishes. They also make great ketchup. The number of salad tomatoes you grow has to depend on your family’s salad tolerance. If you’re considering planting herbs and want to produce some wicked pesto, opt for the large leaf variety of basil seeds but, unless you’re keen on an aniseed flavour, avoid the seed packets with pictures of slightly wrinkled large leaves, it’s the smooth ones that make classic pesto. Coriander, parsley, dill, oregano, marjoram and savoury are all easy to grow from seed in window boxes, pots or patches of ground close to the kitchen so you make maximum use of them. However, I have only managed to grow thyme from an established plant – usually available for less than 2€ from a garden centre. If you re-pot it in a larger container and give it a bit of a trim it will soon expand and give plenty of fresh shoots. The difference in the taste of your food when you have abundant fresh herbs at your disposal is incredible and you are unlikely to ever go back to the dried-up shadow of the natural flavour that comes in shop bought jars. Many of the vegetables and fruits I had previously thought were rather bland, such as cucumbers, melons and bananas, I’ve discovered are mouth-wateringly different when picked straight off the plant. If you’re inspired to begin The Good Life, get along to your local garden centre or supermarket for seeds and potting compost. The time for planting your first crops is now. What have you got to lose?